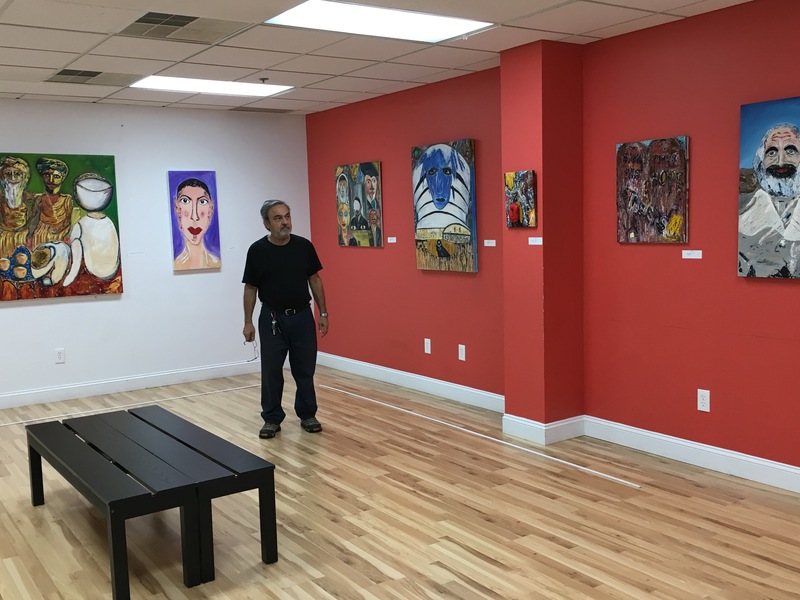 On October 3 – 4, 2015, Footprint co-founder, artist and counselor Dr. Herzel Yerushalmi, beelZan, presented his paintings at Gallery at IndieGrove. 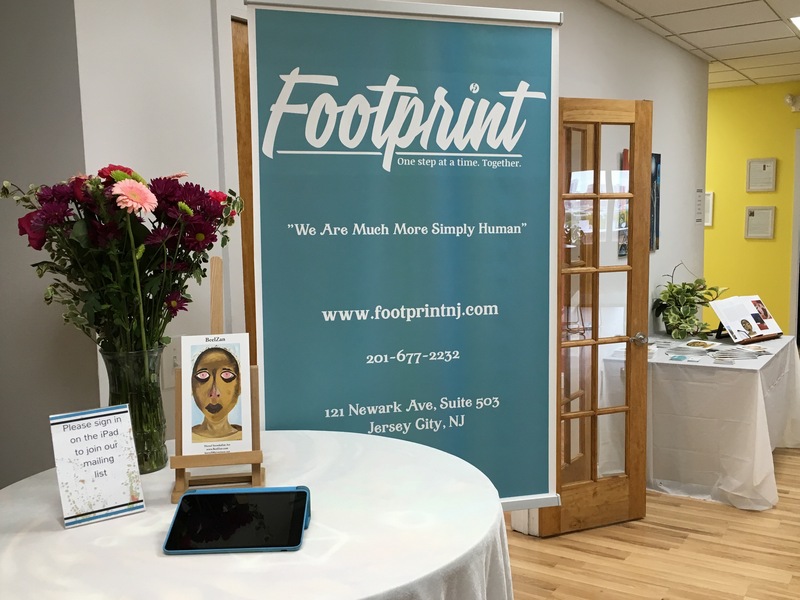 As part of the greater Jersey City Art and Studio Tour, the art exhibit was sponsored byFootprint Counseling Services for Growth and Thriving. Viewing art an instrument of non-violent action for social change, 70% of the sales of the exhibit were to provide counseling to residents of the Jersey City community who cannot afford the care they need. “BeelZan” in Farsi means a laborer, a farmer; one who carries a shovel and digs. Considering myself a laborer and art the expression of pleasure in artistic labor, I sign my paintings ‘BeelZan’. I see my art as an expression of the struggle to make sense of the hurt and pain of the human condition. The meaning and expression of art for me lies in my belief that what has become “normal” in our society are unrealistic images of a fantastic and selfish reality. These images have become ideals by which we are living by and through. To refuse to live by these false offerings is a an act of self determination. The artist lives both simultaneously. Art is an effort, an experiment and experience, in bridging between the two. It is sanity in an increasingly insane society. Within this tenuous dialectic of appearance of reality and reality, my paintings protest resignation, complacency, and machination of our psyche. My approach facing the canvas is intense, intuitive and universally autobiographical. I try to explore the depth of our psyche, artistically, tapping on our existence through anxiety, tenderness and empathy. Aesthetics make us moral and thus heal us. When All relationships are made into “things;” people are made to believe in chemically induced happiness, a promise of salvation through this or that technique, in dialogue with machines, games, a face in a book—the psyche hurts, aches and suffers. Viscerally one longs for something new. The series of painting on display reflect acting on these worlds. Each painting is a forceful and urgent experience of a desire for the birth of New Relationships: with nature, our body, person-to-person, God, race and class. By challenging the boundaries of our conventional aesthetic-visual perceptions, an artist becomes a midwife giving birth to new relationships, his/her tools a brush, paint and the paintings his vision. Art is therapeutic. Therapy is art; rather than a technique. Human beings are relationship oriented. From very early on and all along the course of our life we search for relationships. Therapy is a relationship, an interpersonal one, and one that bears the potential to be renewing. A new relationship that never happened before, that challenges the boundaries of our self and world perceptions and thus may give birth to new growth experiences. The artist and the artful therapist both serve one core purpose, or IDEAL: To Make the World a Better Place. That is why BeelZan labors to paint and Dr. Herzel Yerushalmi co-foundedFootprint Counseling Jersey City . Gallery@Indiegrove, Footprint Counseling New Jersey and BeelZan moments before the opening.